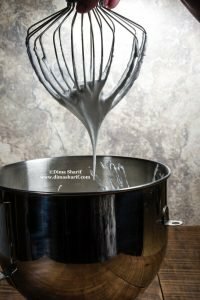 I have been receiving your emails regarding cookie decorations and royal icing, and have attempted to reply to each one, but since there are lots of them, and due to the overly busy schedule right now, I decided to write a post about Royal icing to answer all your questions and to share it with others who might be looking for the same info too. I have also included for you some relative links, especially for cookie cutout recipes and a video playlist that demonstrates cookie decorating techniques including, brush embroidery, lacing, cracked glaze effects, filigree…. as requested. I have put all your questions below and answered them for you. I have tried to make it as thorough as possible, but if you still have more questions, or need more help, please don’t hesitate to leave a comment. Please put your questions in a comment below instead of an email, as it is faster for me to reply. My inbox is always full. Royal icing is your gateway to cake, cookie and pop decoration. It is the basis for many designs, and the detail work that showcase a given design. Royal icing is versatile; it can be used to outline a design, to create shapes and figures, to colour, to write a message and to illustrate effects such as waves for instance, pearls, embroidery, lace… It is also used as glue to stick decorative pieces, shapes and figures onto a cake, cookie or other decorated foods. Royal icing outlined and smudged in with a brush is a genius way to create the embroidered effect… there are many uses to Royal icing, it is every decorator’s staple tool. If you want to take up cookie or cake decoration, royal icing is one that you have to master. What exactly is Royal Icing and what is it made of? It is the icing that is wet at first, but when it dries out it becomes chalky, hard and smudge-free-dry. Like any icing, it’s main ingredient is confectioner’s sugar (icing sugar), therefore it is super sweet. The ingredient that gives Royal icing its hard-drying property is egg whites. The icing sugar is mixed with egg whites and flavoured to your desired flavouring. I usually add a squeeze of lemon to the mix, to cut through the intense sweetness. Because of today’s health issues and worries about the quality of and the intake of raw egg whites, Albumen Solution or Pasteurised Egg White Powder provide a safer substitution. Of course sugar has to be taken into account here, and so this is best left for decoration purposes and occasional uses. On the same hand, food colouring are also best taken into account as store-bought food colours are absolutely bad for your health and highly hazardous (make your own instead, the method is on this link). Royal icing is so versatile it has many applications in food decoration. The most basic use for it is piping shapes, letters and details. From outlining a cookie, to piping shaped borders around a cake, to writing messages, or creating facial features… all these are piped shapes. The naming comes from placing the royal icing in a piping bag – usually fitted with a specific shape tip – and squeezing the bag to pipe out the icing through the tip in order to create the desired shape. Another very common and important use for Royal icing is to act as glue, where the icing is piped out onto the surface you are decorating then topped with a shape, a cut out, a decoration item like edible silver balls, pearls, candy jewelry…etc. Since the icing is wet at first it adheres to the surface and to the piece you wish to stick. as it dries out hard, it hangs on to the piece and therefore holding it in place. If you pipe out shapes on parchment paper – such as snowflakes, faces, lace or any piped figures – and leave it to dry out completely, you can then peel off the parchment paper and end up with a hard piped shape, which you can transfer onto your cake or cookie. Use Royal icing to stick these in place. Royal icing can also be used to coat a cake instead of buttercream, or fondant. This technique only works over Marzipan covered cakes, and the Royal icing is usually made a day before as when it sets, all bubbles clear out and it becomes easier to handle. Freshly made Royal icing is fluffy and hard to manage for this function. For this use, glycerin is usually added to Royal icing to facilitate soft cutting of the cake. After all it does harden up which will not be easy to cut. Other than coating a cake to a smooth finish, royal icing can be used to create specific effects, such as waves, clouds, and an embroidered finish… This does not necessarily have to be on royal icing surfaces only. You can spread some white royal icing over blue fondant to create a wave effect, kind of like the small waves at the sea. What are Royal Icing Runouts and flood-ins or floodings? Runouts and flood-ins are techniques used with Royal icing to achieve a desired shape. A royal icing can be thinned with a little bit of water to achieve a runny consistency (in which it freely pours off your spatula when dipped in the icing and lifted). This runny or flooding royal icing is usually used to fill in an outlined cookie with a desired colour. Like in the trees above. The cookie was outlined with the proper (soft peak) royal icing icing (before thinning), then thinned royal icing was flooded inside the border to colour the tree green. Watch this video for a demonstration of this technique. Runouts, can also be carried out on parchment paper, in the same effect as above, left to set, then transferred onto the surface you wish to decorate. What is Brush embroidery in royal icing? Brush embroidery is when you use a decorator’s brush to pull in the piped royal icing line. This pulling creates a streaked effect that looks beautiful and gives the design an embroidery effect. here is a video that demonstrates how that is done. What is royal icing lace? Lace in icing is very similar to lace in clothing/curtains. It is an effect that makes the design look similar to fabric. There are many lace designs, but in general it is all about mixing lines and dots. Where the lines overlap and the design is created with dots. The best way to explain it is by watching the tutorial below. How Can I thin Royal Icing? Royal icing can be thinned down to a runny consistency with water. Remember to start with little drops of water (a little drop goes a long way). It is icing sugar after all! Colour flow is a Wilton product, which is a ready mix that is used to achieve runout consistency royal icing. Kind of like a cake mix. It is made For flooding and filling centres. Just follow the package instructions to achieve the desired results. Tint with desired shades like you would with royal icing. Just note that you do not necessarily need to use colour flow, you can achieve the consistency using water as mentioned in the point above. How to Tint Royal Icing? 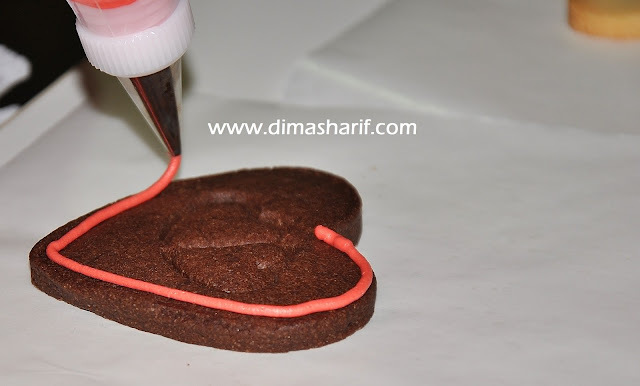 After making the royal icing and whipping it to soft peaks, you can tint it using gel or powdered food colours. The thing to be aware of when colouring is that a little bit goes a long way. Therefore, add just a tiny bit of colour and gradually work your way thr ough to the desired shade. An easy way to tint, is to dip a toothpick into the gel colour and then dip that toothpick into the icing. Stir using an offset spatula till the colour is fully incorporated and no streaking is visible. It is Royal Icing. Anytime you need an icing for reliable sticking of pieces together, use royal icing. The same icing is also used to pipe decorations and details. On areas where smudge-free-hard-drying is not required, you can use any other icing you desire, such as the layer of snow on the roof of this gingerbread house. How can I pipe straight lines without shaking? My lines look like zigzags! Just like with any other new manual skill, practice is all you need to achieve the desired results. Through practice you will get used to the required amount of pressure on the bag in order not to over squeeze, or shake while squeezing. Also through practice you will get to learn the wrist movements required for circles and edges. It is all about the icing consistency. If it is too dry, it will be hard to squeeze out, and you will shake as you squeeze. If it’s too soft it will flatten as you go and at times run down the edges. 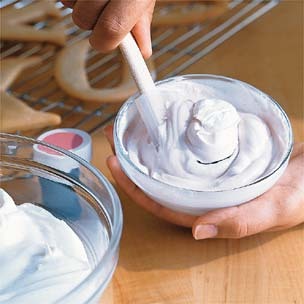 The icing has to be whipped to soft peaks to be at the right consistency, and should not slide off the spoon or spatula. The movement is in the wrist not the elbow! move your wrist, kind of like when you are trying to get rid of the tension in your wrist. Do not move your elbow. This will help you tremendously, especially when going in circles. when piping, lift the tip up making the icing line drop on the surface instead of dragging it on the surface. Lines made this way are always straighter. Practice, practice, practice. The only road to perfect. What is the right consistency of Royal icing? For piping sugar flowers and leaves: whip until it has reached stiff peaks. For piping lines dots & borders you need to mix to soft peaks consistency. For filling in centres and flooding you need a runny consistency that spills off as you lift the spoon after dipping in the icing. I can’t find colourful balls to decorate the tree, what else can I use to get the same effect? Make Royal icing pearls! Pipe dots of royal icing in different sizes on a sheet of parchment paper, then dust them with pearl powder for the same effect. You can even make the pearls using tinted royal icing. Allow them to cool and then release and use them as you would the sugar pearls. Here is a video that shows you how you can do that, and also demonstrates a beautiful wedding design cookie. I bought stamp cookie cutter what can I do with it, other than pressing shapes onto cookie dough? You can use it to press the shape onto fondant, kind of like an outline. Use the outline as guide to pipe Royal icing on the fondant to bring the shape to life with colour and details. You can also use it to press on the cookies themselves instead of on the fondant topper, then outline the pressed cookies with Royal Icing. How can I make Royal Icing? How Can I store Royal Icing? Find my Royal Icing recipe on this link, you will also find storing method on the same link. Hope this answers your questions, and helps you better understand Royal Icing. Here are some relative links for you to explore. If you would like to learn more about cookies, cookie decorations and cookie Bouquets then make sure to join Dima’s Course: Cookies: Baking, Decorating & Cookie Bouquets. Can you please advise where you get the food colors and other cake decor items in Dubai? I've never been able to make royal icing properly with the correct consistency so thanks for this tutorial and excellent tips. And where can I get egg white powder? Could you please tell me why my royal icing never got hard? I let them dry over night and the tops of my cookies were still soft! When royal icing does not become hard when it sets, it is usually a problem with the ratios (too much liquid to dry). However at times and depending the amount of icing sugar used, it might require longer time to set. If you are doing flooding or run-outs, and you have used lots of the icing, it might take longer to set, appearing set on top but still soft underneath. All you need to do is leave it longer. How soon can I make royal icing for a Gingerbread House Decorating Party? Can I put it in individual piping bags, with the ends not snipped and a rubber band? Will it keep for a day like that? Yes it will. In fact royal icing can keep for up to 2 weeks if in an airtight container. You might have to re-whip it though as it tends to separate when it stands for a few days. Royal icing should be relatively stiff, but not very stiff and hard to squeeze though. It must not be runny and must not drizzles on its own if the piping bag is held upside down. It sounds like your icing needed more liquid. Don't throw it out though, just thin it with a few drops of water until you reach the right, stiff yet not runny consistency (if it becomes too runny stiffen up with icing sugar or it wont stick the pieces together properly). I also suggest you try my recipe above, it is fail proof. Do you have the conversions for your recipe? Conversions for weight? Yielding? am not sure what you are referring to? Thanks for this useful post. I have a little question. I to make a Xmas cake for the 25th and I want to make snowflakes with royal icing. How soon can I make them? And how long does ot take to dry really hard? Thank you and Hapoy Holidays!